ATLANTA, February 1, 2019	(Newswire.com) - Ovie Mughelli is a bruising fullback for more than a decade. The former All-Pro player was known for punishing linebackers, but also for his engaging personality and ability to have fun with his teammates both on and off the field. 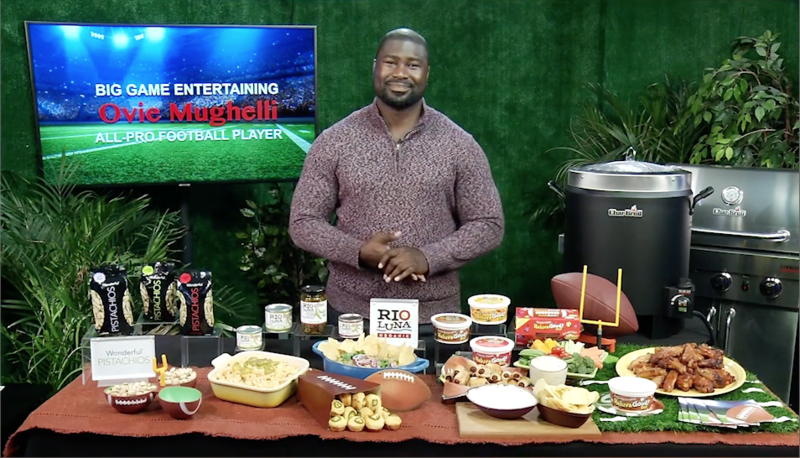 Mughelli is a former network TV Sports analyst, so he still finds plenty of time to watch the Big Game while partying with friends. Just in time for the Big Game in Atlanta, Ovie shares his can’t miss party tips. No game day is complete without dip as the centerpiece, and what makes entertaining easy is Heluva Good! Dip, a delicious, bold-flavored dip that is perfectly rich and creamy. They are always a crowd-pleaser and pair perfectly with dippable favorites, like chips, veggies, pretzels, wings, and more. It is available in seven flavors, including French Onion, Bacon Horseradish, and Buttermilk Ranch. Now Heluva Good! French Onion Dip comes in one half of the lid and a favorite dippable in the other. This limited-edition football-shaped container is the perfect snacking centerpiece for Big Game entertaining. Plus, it is resealable and reusable for games to come! They are offering a limited edition FootBowl, a football-shaped container that can serve you can find Heluva Good! Dips can be found in the dairy aisle of local grocery stores today. For more information, visit www.HeluvaGood.com. The secret to adding a pop of flavor to any favorite game-watching food is Rio Luna Organic Peppers. They do not have any fat or a lot of calories, and they really add a pop to almost any dish. Try making the delicious White Chicken Chili with Jalapeno Cornbread Muffins and some Green Chili & Avocado Baked Macaroni & Cheese that are guaranteed to score big with all the football fans watching the Big Game. Find these peppers in local grocery stores, and they come in four varieties: Diced Jalapenos, Nacho Sliced Jalapenos, Diced Green Chiles, and Large Chopped Green Chiles. Learn more ways to spice up the Big Game party and find recipes for everyday meals at riolunapeppers.com. There must be something tasty around for people to snack on throughout the party. The perfect thing is to have bowls of Wonderful Pistachios laying around. Not only are they delicious, but they are a good source of protein and fiber. Go with the classic Roasted & Salted Wonderful Pistachios, or go with something different like Sweet Chili and Salt & Pepper. There really is no bad choice. Just serve up in a bowl for guests to grab and do not forget to leave out an empty bowl for the shells. For more information, visit www.getcrackin.com. In addition to all the good sides, the main event is the best part! Chicken Wings are game day classic, but they have to be made just right. That is why Char-Broil grills and cookers are the best options. They are known for making “the Most Forgiving Grills on Earth,” but they have created The Big Easy Oil-Less Fryer. It is the easiest, safest, and healthiest way to cook all of the favorite game day food. It uses the same TRU-Infrared™ cooking technology found in Char-Broil’s gas grills, so of course, it will be juicy inside and crispy outside every time. Plus, it saves people on the calories and clean-up. Also, there is a way to get a portable Char-Broil grill for free. Simply share a picture of your awesome big game spread tagging Char-Broil on Facebook and Instagram, and use the hashtag #CharBowl to be entered to win. Char-Broil's Big Easy Oil-Less Fryer will make all of the future game day events a big hit. For more information, visit www.charbroil.com.